Distraught, the cheapest thing in Bangladesh is the life of innocent people. Government and opposition both sides are bleed the general people for their own interest. The present Awami League government is dogged to stay in power since the conclusion of 5th January election drama, in contrary to that, BNP steps to oust the government from the power by all means. The government intercepted BNP not to continue their anti-government movement. Similarly, BNP also attempts to counteract in response of the government’s initiatives. For they cannot protest peacefully, they are being engaged in violent activities. Sometimes, the government conspires, hurling patrol bomb, to incriminate the BNP leaders to make its seat stronger.The government ordered police and BGB to fire at sight if they see any protester to protest in against the government. More tensely, a senior police officer ordered his forces to extinguish the families and offspring of the so called ‘terrorists’, while shouldering all the responsibilities upon himself. For stiffness of the law enforcing agency and government, BNP is protesting and hurling bomb from hide out. Consequently, the innocent people are being burnt down and are passing away enduring intolerable pains. Thisconfrontation will afflict the general people until and unless the government changes its mind either to find a peaceful solution or leave itspresent illegal and undemocratic power. The situation has reached to such a stage that general people are being victimized by political leaders, public servants, law enforcing agencies and even at last by judiciary not having justice. If we look over the recent statistics along with last six years inevitably the scenario is worse than our imagination. Twenty-party-alliance, to oust the government, announced countrywide blockade when the government obstructed BNP chairperson to attend in pre-declared mass demonstration in 5th January 2015. Then the government ordered law enforcing agencies to fire at sight and BNP ordered its leaders to instigate violence to success the countrywide blockade.On 6th February 2015 the Daily Dhaka Tribune published in its online version under the headline “3 Jamaat-Shibir leaders were killed in shootouts”. The Daily Star published in its online version on 10th February that a local leader of BNP’s student front Jatiyatabadi Chhatra Dal (JCD) was killed and another person hacked and shot in separate incidents of Sonaimuri upazila in Noakhali during BNP-led 20-party alliance’s countrywide blockade. Most frivolous and heinous event of last few days was the slaying of Sadia, daughter of a Jamat leader in Jatrabari, and her mother by knife when she did not have her father at home. Some Bangladesh Chatre League (BCL) men, student wing of Awami League, came to seek Sadia’s father intending to kill him at their home but not finding him they killed his innocent family members instead. Before extracting recent information of political violence, let me show the statistics of political violence during last six years from 2009-2014 according to a study on political violence published by Odhikar, a NGO working in the field of Human Rights in Bangladesh. The study shows that only in 2009, 15403 people were whether killed, or tortured, or injured, or disappeared, or died in the prison. 14688 In 2010, 12056 in 2011, 17725 in 2012, 25504 in 2013 and 10122 in 2014. Besides, 936 people were killed during six years, 318 were tortured, 1429 were killed in border, 93324 people were killed or injured for political violence, 170 were disappeared, 391 were died in the prison and total 96498 people were affected for political instability. This alarming rate of violence can only happen in a state engaged in heavy war. Now following study is related to the recent political violence. Prothom Alo published a study in its paperback version. Almost all districts are detached from the capital for an uncertain period since the declaration of BNP chairperson.By the sake different names, such as, shootouts, crossfire, gun-fighting government is killing the people of oppositions. Around fifty people have been killed in the hand of law enforcement agencies in last 50 days of the countrywide blockade. Every day here there of the country the incidence of government sponsored killing is being held. Besides that, the law enforcing agencies have arrested approximately 17 thousand opposition leaders, activists and supporters all through these fifty days of blockade. Government’s this killing missions are carried out to stop the political movement of oppositions. Government is often using one signpost to legitimate these killing missions that is the so-called terrorism. It’s true that incidences like petrol bombs or cocktail are happening during the blockade and Hartals of the oppositions. But it does not mean all these petrol bombs and cocktail are being thrown by the activists of oppositions. It also does not mean that people involved with these blemished petrol bomb and cocktail culture lose their status of right to life or right to fair trial. But for the sake of petrol bomb and cocktail incidences the government is legitimating its shootout and crossfire killing mission in such a way that they are terrorists they can be killed at sight.Reportedly several activists from government bloc have been held by the general people or police during their participation with the carrying or exploration petrol bombs. The Daily NoyaDiganta published news in its editorial page in 7th February that the councilor of 09 no. ward of Narayangonj city is accused of arson in bus. But the councilor claimed that he, even anyone of his party, did not set on fire any vehicle but he is accused of arson. His wife even his children were victimized and harassed by law enforcing agencies. This statement obviates that the government and its activists are also involved in violence. The same day it also published that 3 Chatra League leaders were arrested in Noakhali while hurling bomb in house of a justice. On January 29, 2015, the Daily New Age published news under the headline “AL leader’s son is arrested with bomb”. These incidences explicitly indicate the government’s involvement in the petrol bomb or cocktail culture. Government’s involvement in these incidences is more than logical because of several reasons. Firstly, government is taking advantage of these incidences by blaming oppositions for restoring its desperately lost public support. Secondly, the legitimacy of government’s killing mission by for the sake of petrol bomb and cocktail are becoming easier. Thirdly, government is voicing to outer world for the legitimacy of their 5th January partial election by showing the scenes of political violence in political movements. 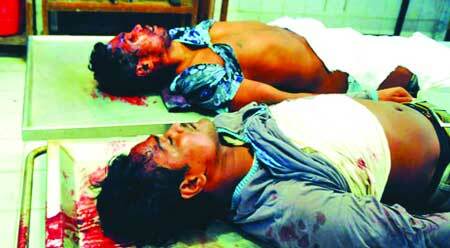 Awami League went about to prove that BNP led-twenty-party-alliance is a terrorist alliance. But this attempt has been failed as the government itself is proved to be culprit behind this political deadlock. Now let’s talk about constitutional and legal consequences of these extra judicial killing missions. This hellish massacre violates fundamental rights enshrined in article 27, 31, 32 and 35 of our constitution.Article 27 says that all citizens are equal before law and are entitled to equal protection of law. Section 32 of the constitution of Bangladesh states that every person has right to life and personal liberty enjoying the protection of law and it is inalienable right of every citizen.In pursuance to article 35, every accused person has right to protection in respect of trial and punishment.Bangladesh has,subject to the Universal Declaration of Human Rights (UDHR), ratified all the core human rights treaties such as, ICCPR, ICESCR, CERD, CEDAW, CAT, and CRC. Article 5 of the Universal Declaration of Human Rights signifies that no one shall be subjected to torture or to cruel, inhuman or degrading treatment or punishment. International covenant on civil and political rights, which was adopted in 1966 and ratified in 2000 by Bangladesh, certifies that every human being has the inherent right to life. The concept right to life has been well defined by a series of judicial pronouncements. Life within the meaning of right to life in Article 31 of our Constitution is something more than the mere animal existence.In Faisal Mahtab v. Banngladesh reported in 44 DLR the Supreme Court of Bangladesh signifies that an individual shall be dealt with in accordance with law. Thus, any action or inaction injurious to life or liberty of anyone outside of law is illegal. On 17th November 2009, a Division Bench of the High Court of the Supreme Court of Bangladesh passed a suomoto Rule to show cause as to why appropriate action shall not be taken against Major Kazi Wahiduzzamn and Lieutenant Hasan and their companion for the liability of killing LutforKhalashi and KhalilurKhalashi of Shirkhara union under Madiripur Sadar Upzila. For many, this was a long awaited and much needed reassertion of the rule of law. But unfortunately this sense of hope came to a halt as 19 more ‘crossfire’ was reported in the subsequent 50 days and still this extra-judicial killing is on the rise. Moreover, the government is, by arson or hurling the patrol bomb in the vehicles, conspiring to incriminate the BNP led-twenty-party-alliance. Though the government does not permit BNP to assemble as a right to protest or assembly under article 37 of the constitution which means that every citizen shall have the right to assemble and to participate in public meetings and processions peacefully and without arms subject to the restrictions imposed by law, they should not use any corrosive substance to victimize the innocent people as they are not involved in any political party directly and it is an offence under law of Bangladesh. Hartal or Blockade. Because government is somehow the ultimate beneficial of these actions, they want these actions to be continued. Responsibility rests upon the government also. According to Prothom -Alo report, approximately 53 people were died for bomb till 12th February. In 1st February the police caught a BNP leader named Abdur Razzak while fleeing after setting a bus on fire near the New Market. As a democratic party they should not nurture these malpractices against the innocent people.Section 03 of The Explosive Substance Act, 1908 states that Any person who unlawfully or maliciously causes, by any explosive substance, an explosion of a nature likely to endanger life or to cause serious injury to person or property be punishable with death or imprisonment for life or imprisonment which may extend to ten years and shall not be less than five years whether any injury to the person or property has been caused. For the sake of using any explosive Substance the government cannot kill or order to kill anyone at sight or anyone cannot be subjected to shootouts or crossfire. Everyone has a right to have a fair trial under our constitution. But the government constrained opposite parties and compelled them to instigate violently. As a result of longtime political instability, the situation is deteriorating rapidly and economic growth has already been collapsed. We are desperate while prime minister, to recriminate the opposite parties, opposes to talk over the fair and free election to resolve the problems. So it is only the judiciary which can interpose to eliminate so called “crossfire” to secure the justice though the government has already politicized this last hope of the oppressed people. We are waiting reinstatement of justice in Bangladesh.